The Konica Minolta Colorful Tomorrow Foundation (CTF)*1 has presented the funds raised by the employees of Konica Minolta Business Solutions U.S.A. (BUS) and the company to International Rett Syndrome Foundation (IRSF)*2 a nonprofit organization dedicated to finding a cure for Rett Syndrome. Rett Syndrome (RS) is a debilitating neurological disorder diagnosed almost exclusively in young females. Children with RS appear to develop normally until ages six to 18 months when they enter a period of regression, losing speech and motor skills. RS leaves its victims profoundly disabled, and requires maximum assistance in every aspect of daily living. 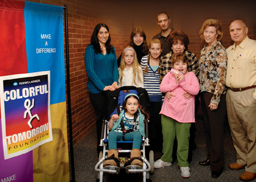 In Late 2007, the CTF's Board of Trustees was made aware of Rett Syndrome by being introduced to the story of a young girl with the disorder, the daughter of a long-time Konica Minolta employee. Motivated to provide more colorful tomorrows for children, the CTF initiated an employee fundraiser throughout the month of January 2008 to raise funds and awareness for the IRSF, and their newly established clinic in New Jersey. This new clinic is set to begin specialized treatment in the hopes of one day finding a cure for RS. By the end of January, Konica Minolta employees in three New York-area offices (Ramsey, NJ; Blauvelt, NY; and Windsor, CT) had contributed more than $8,300 towards this fundraiser. Inspired by the generosity of the Konica Minolta employees, Jun Haraguchi, BUS President and CEO, implemented a corporate matching program, where he authorized the matching of all employee donations dollar-for-dollar. In total, more than $16,600 was raised, and led to an increased number of little girls that can be accepted for treatment, thus increasing the chances of finding more effective treatments and ultimately a cure for RS. The money was presented to the IRSF on Friday, February 15th 2008 during a special luncheon held at the headquarters of BUS to honor its employee donors – as well as the IRSF management team. A non-profit organization established with the goal of expanding Konica Minolta's social contribution initiatives in the U.S. Members of the management team of BUS serve as CTF's Trustees and Officers voluntarily and without compensation. 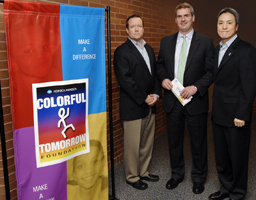 See "The Konica Minolta Colorful Tomorrow Foundation Social Contribution Initiatives in the U.S." for further details. The world's largest private funder of scientific research seeking a cure for Rett Syndrome. The core mission of the IRSF is to fund research for treatments and a cure for Rett Syndrome and enhancing the overall quality of life for those living with Rett Syndrome.